Each KeyFrame Marker contains all the information required to define the motion sequence between its adjacent KeyFrame Markers. Placing the cursor over a KeyFrame Marker and then right clicking brigs up the KeyFrame Options Dialog Box. Figure 8 shows the KeyFrame Dialog Box associated with the KeyFrame pointed to by the arrow.. This dialog box contains all the control access necessary to manage the motion sequence. All the parameters that are exposed I this dialog box can be controlled from the main menu system or from other places. 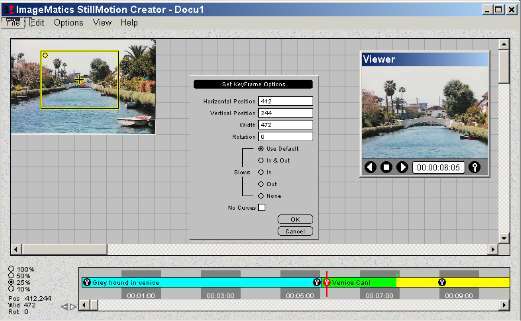 The KeyFrame Dialog Box provides the experienced user with a centrally located resource that provides quick and complete control over the movies behaviors. The dialog shows the current values and provides for them to be manually changed. The Horizontal and Vertical Position fields provide the location of the upper left hand corner of the Camera Window. The Width field provides the width of the Camera Window. The height is automatically set as the aspect ratio is fixed for the entire movie. The aspect ratio may be changed under the Options menu. The Rotation Angle is provided in the next field and may be modified. The motion attributes can be controlled by the selection of attributes on of Slows. Slows refers to the acceleration of the image motion as it starts and stops. Slow In starts from still and speeds up to a constant speed. Slow Out refers to the speed slowing at the end of a motion sequence. The KeyFrame markers define the motion sequences start and ends. No Slows provides constant speed throughout the motion sequence. The No Curves selection will cause the path between KeyFrames to move in straight lines. The default uses curves that are generated between two or more KeyFrames. If there are only two KeyFrames this control will have no effect.